Disclaimer: if you are a proficient blogger or blog follower, this post will be of no use to you. For those of us still learning, I hope this helps with some outstanding questions. As I’ve been learning about blogging and discussing this blog with friends, several questions have been raised as to how to follow a blog. Isn’t there a way to subscribe? How do I know when a new post is up? I saw it on Facebook today, but what if I miss it in my newsfeed next time? Etc. Here are a few (hopefully simple) answers to some of the basic questions. You have options and can choose the access method that works best for you. For simplicity’s sake, I will describe each option related to Looking Well, but all the options apply to most blogs. If you would like to subscribe to the blog, you can enter your email address and receive an email letting you know new content is available. This allows you to read the posts on your own time and keep the emails until you know you have read the post. 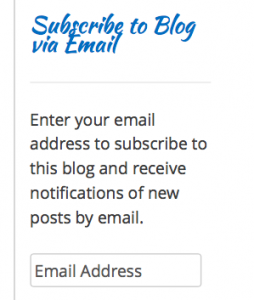 The form to subscribe on Looking Well is on the righthand side of the blog page and looks like the image to the right of this paragraph. For those who prefer not to be on an email list or receive more emails than they already do, a feed reader (like Feedly) allows all updated content to be accessed in one place. Simply search for “http://www.lookingwell.info” and add the site to your reading list. Looking Well also has a Facebook page where all new blog posts (and occasional other content) are posted. You can Like or Follow the page (or both!). Following also gives you options for how you would like the posts in your newsfeed and whether you get notifications. If you prefer to browse the web, or simply want to control your viewing opportunities, you can also simply drop by the site when you have a few minutes. The front page lists the 5 most recent posts, and the Archives are found on the right sidebar if you need to go farther back.